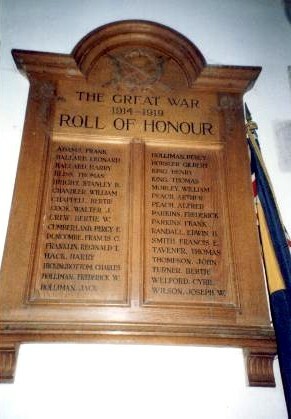 The War Memorial is located inside the Parish Church. There is a new War Memorial on the Green, but this has no names engraved upon it. Lance Corporal 33006. 8th Bn., Leicestershire Regiment. Formerly 4817 Beds. Regt. Killed in action Thursday 3 May 1917. Lived Chorlton, Hants. Enlisted Dunstable. Buried: BAILLEUL ROAD EAST CEMETERY, ST. LAURENT-BLANGY, Pas de Calais, France. Ref. II. E. 34. Note: Possibly place of residence should be Chalton, Beds. Private 42823. 7th Bn., Lincolnshire Regiment. Killed in action Saturday 23 March 1918. Age 19. 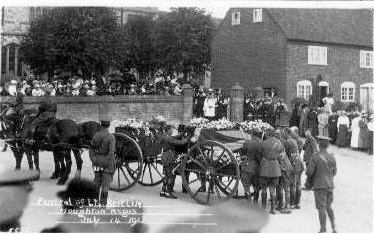 Son of William and Sarah Ann Bright, of 87, High St., Houghton Regis, Dunstable. Born Dunstable. Lived Houghton Regis. Enlisted Luton. Buried: SAILLY-SAILLISEL BRITISH CEMETERY, Somme, France. Ref. V. C. 1. Lance Corporal 3/8191. 7th Bn., Bedfordshire Regiment. Killed in action Saturday 1 July 1916. Born and lived Houghton Regis. Enlisted Bedford. Buried: DANTZIG ALLEY BRITISH CEMETERY, MAMETZ, Somme, France. Ref. VI. V. 5. Private 19077. 1st Bn., Princess Victoria’s Royal Irish Fusiliers. Formerly 146482 R.F.A. Killed in action Wednesday 11 July 1917. Born Houghton Regis. Lived Dunstable. Enlisted Luton. Buried: CRUMP TRENCH BRITISH CEMETERY, FAMPOUX, Pas de Calais, France. Ref. I. C. 2. Private 4668. 5th Reserve Bn., Bedfordshire Regiment transf. to (77251), Labour Corps. Died Tuesday 1 July 1919 . Age 22 . Son of Fredrick and Annie Crew, of 21, Council Houses, Bidwell Estate, Houghton Regis. Buried: HOUGHTON REGIS BAPTIST CHAPELYARD, Bedfordshire, United Kingdom. Near North-West Corner. Sapper 522803. Royal Engineers. Formerly 77th Field Coy., Royal Engineers. Died Wednesday 14 November 1917. Born and lived Houghton Regis. Enlisted Luton. Buried: ST. SEVER CEMETERY EXTENSION, ROUEN, Seine-Maritime, France. Ref. P. III. R. 6A. Gunner 209249. 62nd Siege Bty., Royal Garrison Artillery. Died Monday 20 January 1919. Age 22. Son of Thomas and Annie Franklin, of Chantry Farm, Houghton Regis, Dunstable. Buried: ST. ANDRE COMMUNAL CEMETERY, Nord, France. Ref. I. B. 6. Private G/29673. 10th Bn., Queen's Own (Royal West Kent Regiment). Killed in action Wednesday 23 October 1918. Age 19. Born Houghton Regis. Enlisted Bedford. Buried: HEESTERT MILITARY CEMETERY, Zwevegem, West-Vlaanderen, Belgium. Ref. D. 5. Private 3/7394. 1st Bn., Bedfordshire Regiment. Died of wounds Thursday 3 August 1916. Age 20. Son of Ernest and Matilda Holliman, of 19, Capron Rd., Dunstable. Born Leighton Buzzard. Lived Dunstable. Enlisted Luton. Buried: ST. SEVER CEMETERY, ROUEN, Seine-Maritime, France. Ref. B. 33. 9. Probably: Bombardier 64751, 49th Bty. 40th Bde., Royal Field Artillery. Killed in action Saturday 4 May 1918. Husband of Mrs. L. M. Holliman, of 70, Maidenburgh St., Colchester, Essex. Born Leighton Buzzard. Enlisted Bedford. Buried: SANDPITS BRITISH CEMETERY, FOUQUEREUIL, Pas de Calais, France. Ref. I. E. 8. Private 3237. 1st/5th Bn., Bedfordshire Regiment. Died of wounds Sunday 26 September 1915. Son of Mr. E. Holliman, of 300, High St., Dunstable. Born Dunstable. Lived Houghton Regis. Enlisted Dunstable. Commemorated: EMBARKATION PIER CEMETERY, Turkey. Sp. Mem. B. 71. Lance Corporal 3916. 5th Bn., Bedfordshire Regiment. Died at home Wednesday 3 May 1916. Age 21. Son of Henry Thomas and Jane Elizabeth Horsler, of Houghton Regis. Born and lived Houghton Regis. Enlisted Luton. Buried: HOUGHTON REGIS BAPTIST CHAPELYARD, Bedfordshire, United Kingdom. Near North-West Corner. Probably: Henry John King Private 13035. 1st Bn., Bedfordshire Regiment. Killed in action Wednesday 5 May 1915. Age 30. Son of Alfred and Sarah King, of Tilsworth, Leighton Buzzard, Beds; husband of Ethel Emily Kesteven (formerly King), of 12, Periwinkle Lane, Dunstable. Born Tilsworth, Beds. Lived Dunstable. Enlisted Luton. Buried: BEDFORD HOUSE CEMETERY, Ieper, West-Vlaanderen, Belgium. Ref. Enclosure No.4 XI. D. 7. Private 16837. 1st/4th Bn., Grenadier Guards. Died of wounds at home Friday 9 July 1915. Age 20. 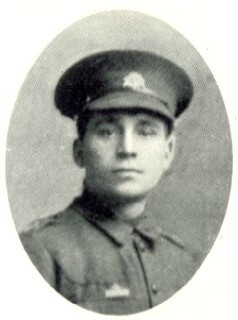 Son of William and Leah King, of Ivy Cottage, Sewell, Dunstable. Born Houghton Regis. Enlisted Bedford. Buried: HOUGHTON REGIS BAPTIST CHAPELYARD, Bedfordshire, United Kingdom. Near North-West Corner. Private 3/7176. 6th Bn., Bedfordshire Regiment. Died of wounds Friday 27 April 1917. Age 28. Son of George and Elizabeth Peach, of Houghton Regis, Dunstable. Born Charlton, Beds. Lived Houghton Regis. Enlisted Luton. Buried: DUISANS BRITISH CEMETERY, ETRUN, Pas de Calais, France. Ref. II. M. 1. Private 23065. 1st Bn., Bedfordshire Regiment. Killed in action Friday 23 August 1918. Born Houghton Regis. Lived Dunstable. Enlisted Ampthill. Buried ACHIET-LE-GRAND COMMUNAL CEMETERY EXTENSION, Pas de Calais, France. Ref. IV. S. 2. Private 18713. 2nd Bn., Bedfordshire Regiment. Died of wounds Friday 22 March 1918. Born Havershall, Beds. Lived Houghton Regis. Enlisted Bedford. Commemorated: HAM BRITISH CEMETERY, MUILLE-VILLETTE, Somme, France. Sp. Mem. B. 5. (Joseph William on memorial) Private 235409. 1st/5th Bn., (Territorial) Northumberland Fusiliers. Formerly 290868 Suffolk Regiment. Died Wednesday 9 October 1918. Born Houghton Regis. Enlisted Bedford. Buried: NIEDERZWEHREN CEMETERY, Kassel, Hessen, Germany II. Ref. D. 18. Private 5832442. 5th Bn., Suffolk Regiment. Died Friday 23 July 1943 . Age 29. Lived 18 High Street, Houghton Regis, Beds. Worked for Home Counties Newspapers Ltd., Luton. Died as a prisoner of the Japanese while working on the Burma-Siam Railway. Commemorated: SINGAPORE MEMORIAL, Singapore. Column 54. 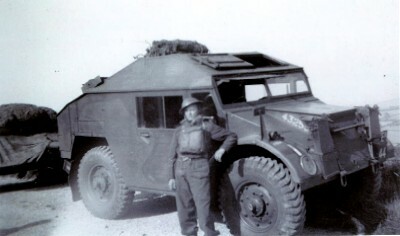 (Allan on CWGC) Gunner 917297. 512 Bty. 148 (The Bedfordshire Yeo.) Field Regt., Royal Artillery. Died Tuesday 12 September 1944 . Age 24 . Son of Wallace and Nora Crawley, of Dunstable, Bedfordshire. Commemorated: SINGAPORE MEMORIAL, Singapore. Column 37. Gunner 900681. 148 (The Bedfordshire Yeo.) Field Regt., Royal Artillery. Died Saturday 3 May 1941 . Age 21 . Foster-son of Arthur Gosbell and Beatrice Gosbell, of Houghton Regis; husband of Thelma Lavinia Doris Gosbell. Buried: HOUGHTON REGIS (ALL SAINTS) CHURCHYARD, Bedfordshire, United Kingdom. Grave 203. 900681 GUNNER J.C. GOSBELL 148 BEDFS. YEOMANRY FIELD REGIMENT R.A. 3 MAY 1941 AGE 21 THEIR NAME LIVETH FOR EVERMORE AND THEY ARE IN PEACE. Gunner 900693. 148 (The Bedfordshire Yeo.) Field Regt., Royal Artillery. Died Friday 8 December 1944. Age 24 . Son of Frederick John and Elizebeth Read, of Houghton Regis, Bedfordshire. Buried: KANCHANABURI WAR CEMETERY, Thailand. Ref. Coll. grave 5. A. 1-47. Ordinary Seaman C/JX 181949. H.M.S. Galatea, Royal Navy. Died Monday 15 December 1941 . Age 17 . Son of Charles Ernest and Ella Richards, of Houghton Regis, Bedfordshire. Commemorated: CHATHAM NAVAL MEMORIAL, Kent, United Kingdom. Ref. 45, 1. Private 5949103. 1st Bn. The Hertfordshire Regt., Bedfordshire and Hertfordshire Regt. Died Monday 1 May 1944 . Age 24 . Son of Percy and Mabel Stephenson, of Houghton Regis, Dunstable. Bedfordshire. Buried: GAUHATI WAR CEMETERY, India. Ref. 1.H.11. Gunner 870976. 148 (The Bedfordshire Yeo.) Field Regt., Royal Artillery. Died Monday 27 August 1945. Age 25 . 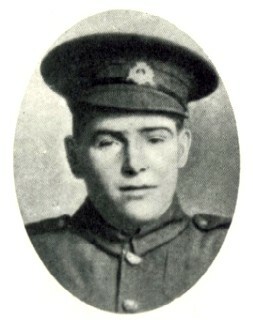 Son of Arthur William and Eva Rose Warner, of Houghton Regis, Bedfordshire. Buried: SAI WAN WAR CEMETERY, China, (including Hong Kong). Ref. V. K. 6. Second Lieutenant, Royal Engineers. Died 12th July 1915. Age 24. Son of Anthony and Alice Margaret Bertlin, of 56, Esmond Rd., Bedford Park, London. Buried HOUGHTON REGIS (ALL SAINTS) CHURCHYARD, Bedfordshire, United Kingdom. North-West of Church.